Weight Loss foods are the most important list you can ever have because cooking healthy is not enough. You must know what foods are healthy for weight loss. So not only must you cook healthy but you must cook the right foods the right way meaning with our grease, sauces and tons of butter and seasonings just to make it test good. Meal Plan and Workouts to help you to lose that first 30 Pounds of Fat! 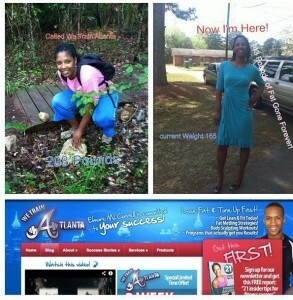 Add us on Facebook and all other social networking sites @wetrainatlanta for more support and fitness results! Mother of 3 drops 43 pounds of Fat for Good! All she did was it the Weight Loss Foods from this List. Check out her new body and how she has even lost weight in her face. Use this food’s list at the bottom and plug it into the eating blue print from my other post and you will be successful. Please take a before picture so we can compare it to your after picture. My name is Elmore McConnell Atlanta’s Top Personal Trainer. 80% of weight loss happens at the Table not in the Gym! Stick to this list of foods in 2013 and you will have Fitness Success Trust me I’m a TRAINER! Check out our site for tips, advice and workout videos! Please post your Results and Weight Every Week Below! If you know of anyone in the Atlanta area who is need of my services please tag or friend suggest them.